A new Cross-Flo static dewatering sieve from Kason continuously removes solids from waste streams at ultra-high rates, allowing clarification and dewatering of slurries in the chemical, food, mining, pulp/paper and industrial/municipal waste industries, at low cost with little or no energy usage. The screening deck is fitted with a stainless steel profile wire screen having slots orientated perpendicular to the flow of material, accelerating fluid through the screen. An extended acceleration/orientation ramp at the upper portion of the unit establishes a proper feed velocity to the profile wire deck, aligning individual fibres in the direction of flow prior to reaching the transverse slotted openings, allowing the widest openings and highest flow rates. The unit is designed to maximise the "Coanda" effect whereby each thin layer of fluid sliced by the profile wire screen clings to the wall of the preceding profile wire, resulting in the acceleration of fluid through the screen. Twin spray bars aid in discharging collected solids from the lower edge of the screening deck, whose angle is adjustable to maximise dewatering rates. 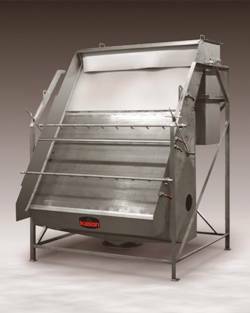 The sieve is offered in widths from 61 to 183 cm, with larger sizes available on a custom basis. Also offered are two-deck models that separate solids into two sizes. All models are suitable for in-plant and exterior installations, and are available with quick-release splash covers. The company also manufactures static sieves for dry bulk materials, as well as circular vibratory screeners, centrifugal screeners, and circular fluid bed dryers, coolers and moisturisers.